Update: Giveaway is now closed. Winners are posted here. Thanks! 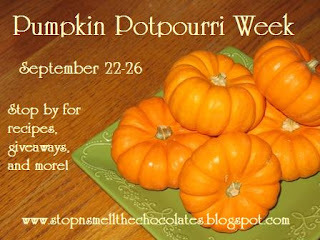 Welcome to Pumpkin Potpourri Week! I'm glad you're here. Can you smell the pumpkin and spice scents wafting from the kitchen? It's the perfect way to announce that Fall is officially here today! 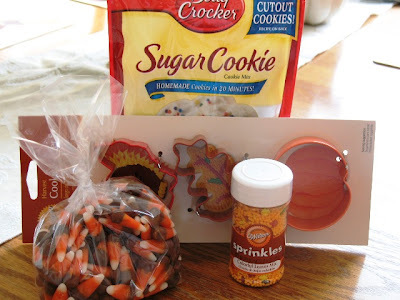 Please stick with me to the end of this post so you get all the giveaway info and the yummy pumpkin recipe at the end! Melissa from The Inspired Room got me to start thinking about Fall with her Fall Nesting, which got me thinking about pumpkin, eventually leading to a pumpkin week. Why Pumpkin Potpourri Week? Well, pumpkin recipes cooking in the house smell fantastic - better than any potpourri - and I'm covering a variety of things about pumpkin this week. Be sure to stop by each day this week. I'll have a pumpkin fact and a pumpkin recipe every day. On Wednesday, you'll have the opportunity to link up with your favorite pumpkin-themed posts. On Friday (as always), you can link up a chocolate-themed post, but this week you can also put up pumpkin posts in honor of Fall! Oh, and there are giveaways! I'm having 3 giveaways. There is one for commenters, one for linkers, and one for promoters. (You can enter all 3!) I'll explain. Book will have recipes featured during the week. *If you don't have a blog, leave your recipes or ideas in the comments and I will enter you. 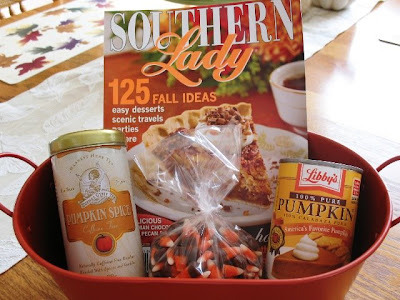 Missing from picture is a pumpkin bread mix with recipe, and it should be noted that I am not actually a Southern Lady, but don't "y'all" think I would fit in? 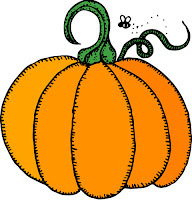 *To promote you can post about Pumpkin Potpourri Week, put a link on your sidebar (with or without the button), announce it in a forum or on a board, stumble the posts, e-mail your friends and family with a link, etc. Be sure to let me know what you've done, so I can check it out if possible! Sound exciting? I hope so! I will close down the giveaways on Sunday night 9/28 and announce the winners on Monday 9/29. Winners will be notified by e-mail and will have 4 days to respond before I have to pick a new winner. Fun, fun! OK, enough of that, let's get to the pumpkin! To start off the week, I thought I better start with a pumpkin recipe for breakfast. The recipe is for muffins and they are actually good for you! Stop a second and drool over the picture (my husband took that one). Preheat oven to 350 degrees F. Grease or paper-line 24 muffin cups. Combine flour, sugar, pumpkin pie spice, baking soda and salt in large bowl. Combine pumpkin, eggs and vegetable oil in medium bowl; stir well. Stir into flour mixture just until moistened. Gently fold in blueberries. Spoon batter into prepared muffin cups, filling 3/4 full. Sprinkle with Streusel Topping. Bake for 28-30 minutes or until wooden pick inserted in center comes out clean. Remove from pans to wire racks; cool slightly. Serve warm. Makes 24 muffins. Combine 1/4 cup granulated sugar, 2 tablespoons all-purpose flour and 1/2 teaspoon ground cinnamon in medium bowl. Cut in 2 tablespoons butter or margarine with pastry blender or two knives until mixture is crumbly. These muffins are a hit wherever I take them. Once I took them to church and was complimented on my "cupcakes", so you know these must be good - LOL! Hope you enjoyed our first day of Pumpkin Potpourri Week! Come back tomorrow to see what's happening and be sure to enter the giveaways! Woo Hoo! I'm the first person to comment! I get bonus points because OBVIOUSLY I like you best lol. I'm sure it's just because I get up before every one else lol. I'll be sure to link up, promote and all that good jazz and let you know when I do it. How fun my friend. I hope I win. I never win anything lol. Don't we all say that? Blessings to you. Sounds like a fun week. Pumpkin and Blueberry. Yum. I will have to make these. Thanks for the giveaway. I love all things fall! Hi! What a wonderful way to start the week! 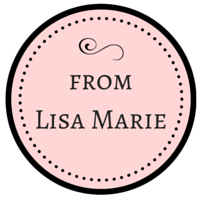 I found you thru Melissa's blog linky on Fall~ I'll certainly be back each day!! Your blog is just plain YUMMY! I found you from Martha's blog and so glad I did, I can't wait to try out the muffin recipe. Please enter me in your fall giveaway and I'll be promoting it too, I love fall!!! Missy, You have such great ideas! This could not be more glorious! What a wonderful post, all filled with Fall delights! Your giveaway is so sweet, so generous. I am so tickled to have found you here. I loved visiting and will be back often! What a good idea...I love to put up coffee recipes and just started fall drinks yesterday so you inspired me to put up a pumpkin drink today! I put your link in my coffee drink post so people could get other pumpkin ideas! MMMMMM pumpkin! I am so glad I get to partake in most of your recipes. No only do you post great recipes, but you make them and they are soooo deeelicious! I am promoting your pumpkin week on my Facebook. Did I win, did I win???? 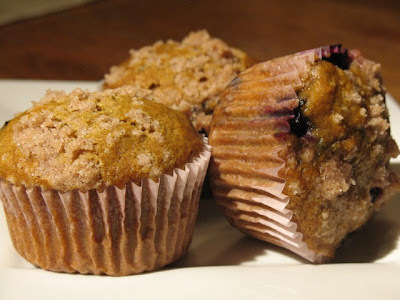 I really need to try the pumpkin muffin recipe - it looks like a winner! This is my first time to visit, but it won't be the last. Thanks for sharing all the inspiration! I'm so glad I found your blog! I LOVE anything pumpkin-y!!!!! What a sweet thing to do!!! Thanks for the chance to win some sweet pumpkins! Wow those muffins look so yummy!!! What a lovely idea to have three different giveaways! I am looking forward to reading all your pumpkin facts. You have really outdone yourself here girl. This looks like a really nice posting, you have put a lot of effort into it. You are going to have a great week. I feel it in my bones. Thanks for the great recipe and for the weight watchers points. This makes WW so much easier. Oh I just copied that pumpkin blueberry recipe...I can't wait to try it..please enter me in the giveaways..I am also adding you to my daily reads...this is so much fun..I will also add you to my blog for the giveaways...take care..
Hey Lisa! I just posted your giveaway on my blog and linked it back to ya! What a wonderful giveaway! Please enter me! Yummy! Those look wonderful! I love blueberries and pumpkins so I will have to try that out! I found your blog through Gina and I must say, everything looks so yummy over here! I'm having a blog giveaway too! Stop by anytime! have a wonderful day! Oh HOORAY!!! I am in pumpkin heaven! I looooooooove any and everything pumpkin, so I am thrilled to see this and look forward to more! Love your giveaway! !Put me in. You will also be on my wednesday post. Thanks again! !I am also gonna link you on my sidepost! Thanks again. Wonderful recipe-gotta try it! What a great week. I'm really glad I found it. I put a post about it on my blog & I'll put a button in my side bar. Thanks for the great contests too. I love pumpkins. I'm so glad I found out about this. Will add you to my sidebar. Have a great day! Oh My Goodness, what a fun blog you have! I just found you and am going to add your giveaway on my sidebar too!! I would LOVE to enter in this. The girls and I can't wait to try these. They sound like they'd be so moist. Thanks! wowza!!! i'm so sad i've missed out on most of this week! but i'm going to try to make up for lost time a little today! 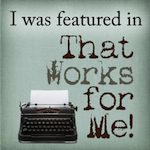 i'm promoting on my Happenings page! and my friday pumpkin + chocolate post will be up shortly! i'm also having a giveaway on my blog! be sure to stop by to enter! Oh my goodness! Just found your blog from Katy Lin's blog!!! I'm a big-time chocolate lover and I love the fall for the baking....great recipe! Going to try those this weekend. I'll be back for more! Please add me to the promoters drawing. Thank you so much! ohhhhh i hope i am not to late to enter your drawing??? i love autumn and pumpkins and and and awwww i just LOVE autumn here in new england!! Whoa, I nearly missed out on the fun! 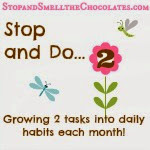 I am just making my way through all the Fall Nesting posts and made it here in the nick of time! Thanks again for sharing your ideas! So inspiring! Hummmm Can I come over for muffins and coffee? 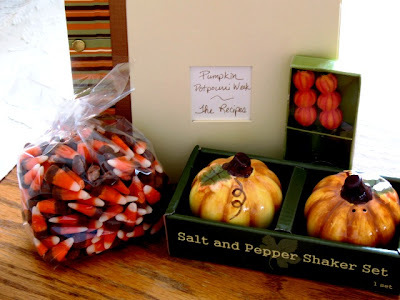 Hi again I've poste pumpkin potpourri picture in my left sidebar and it links to your blog. Does that give an extra entry.? I love all things pumpkin and love all different sizes, shapes and colors in my fall decorating . One of my favorite recipes is Pumpkin Chutney.Sorry I don't have an active blog yet so I can't link to your giveaway. Thanks for giving me the chance to enter. I just found your blog and already love it. I have to say that October is one of my favorite months! Last year I planned a Day of Pumpkins and we did the weekend before Halloween. All my nieces and nephews came over and we craved pumpkins, but instead of the normal Sunday dinners everyone had to make something out of pumpkin. A few things we had were pumpkin seeds, pumpkin bread and pumpkin soup. It is a great start to a tradition we would love to carry on!